Everyone knows that you can not do proper magic without a wand! Wands come in many shapes and sizes, colours and are made of different things. 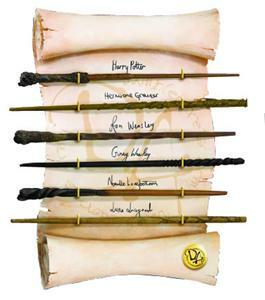 Each wand is made carefully but only one wand can be right for a certain person. Wands can do everything so that is why you have to be careful with them. Some people (He-Who-Must-Not-Be-Named) get out of control with the power and use them in wrong ways. That is why they go to school to learn how to use them properly. They also learn how to defend themselves from wizards/witches that use their wands inappropriately. You need wands to perform magic but please use them in a good way!